If you miss me at the back of the bus…. Forgive my allusion to the famous US civil rights anthem but I thought it appropriate for this post. Over the past few weeks Israel (okay and most of the world thanks to a huge amount of international coverage on major news sources) has been buzzing about the seeming rise of the Haredi (ultra-religious) and their, lets call it, extremely unorthodox behaviour. I do stress that the culprits come from a sect within a sect of Israeli society and do not represent the ultra-religious as a whole. This kind of behaviour, while not new, has certainly gained a lot of exposure over the last few weeks and has brought to light issues that have long been kept contained within that community. What brought it to the attention of the mainstream is the refusal of a woman in Jerusalem to sit at the back of a “kosher bus”. Her refusal a la Rosa Parks ignited a controversy that has filtered into other areas. Israel is a democratic country that prides itself on protecting the civil rights and freedom that is instituted by its declaration of independence. Here, not only are you free to practice whatever religion you want (unlike our neighbours) but you can follow whichever stream or interpretation you want. If you want to observe Shabbat in downward dog or the lotus position – you are more than welcome to! The Israeli government protects religious freedoms and institutions and we the people are most grateful for that. We will not allow for our democracy to become a theocracy. The issue of religious segregation took on a whole new trajectory in the city of Beit Shemesh when Haredi man (yes I hesitate to use the word gentleman) spat on a 7 year old little girl, from a religious observant family, because she was not dressed modest enough. For me the issue is not about religious fundamentalism as much as it is about harassment and abuse of a child and if a grown man who we assume knows the difference between right and wrong sees a 7 year old little girl as something potentially sexual – well this in my opinion is a far greater problem!!! Calling our women in uniform “sluts” because they also refuse to move to the back of a Kosher bus is diabolical. To the man whose immodest mouth spewed such invective, she protects your very freedom to spout your nonsense! Again, I take pride in my fellow citizens as they have come out in support of women’s rights and the protection of freedom of religion. We Israelis are never shy to voice our opinions or discontent! Sadly, once again, the world media, rabid with this juicy story, have chosen to focus their attention on the small lunatic fringe than the greater society. Women in Israel have held some of the most powerful portfolio’s in government – Minister of Foreign Affairs, President of the Supreme Court, leader of the official opposition, high rank in the military and of course, who can forget the incomparable Prime Minister, Golda Meir, tiny in stature but a giant of a leader. We will not allow our rights to be hijacked but the bully boy tactics of a few who hide behind religious tenet but disobey one of the greatest commandments – honouring your fellow man. Or woman! This is Israel. Full of simplicities and complexities. Never boring! Israel’s women have roared these past few weeks. 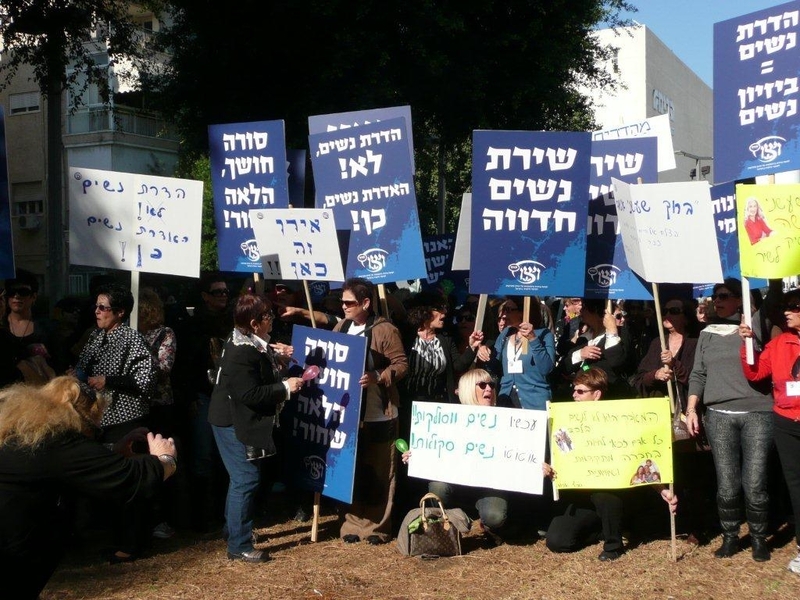 From my WIZO sisters demonstrating in Tel Aviv (see picture courtesy of the fabulous Trica Schwitzer) to social media networking mavens and me, who never passes up an opportunity to jump on my proverbial soapbox, we have made our voices heard. If you miss us at the back of the bus, you will find us nowhere. Come on over to the front of the bus – we’ll be riding right there!